Free Beautiful Flash alert on call and SMS and message alerts application. Helpful application when your smartphone is not in your reach or you are somewhere in very big crowd or noisy place like music party or somewhere in a place where your phone should be silent like meetings, mosque, church and temple so you can use Free beautiful flash alert on call sms message application with its all very simple and beautiful interface and very easy to use design. Free beautiful flash alert on call sms message application will simply notify you about your call sms message through flashlight starts blinking. 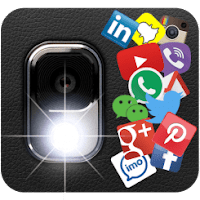 Free beautiful flash alert on call sms message application will blink/alert the camera LED flashlight and notify with camera flash alert notification for call and SMS message notification alerts. Flash alert on call and Flash alert on SMS give you blinking flash alert notifications.